Call it UI, UX, Product Design or by any other name; I aim to create elegant, usable products through proven and modern design practices. 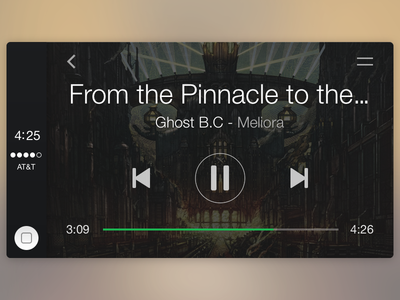 Carplay Spotify — I'm not sure if album art is intentionally not included through Carplay or if my connection doesn't reliably load it, but I miss seeing album art when using Spotify (not that we need more driving distractions). So as a Monday warm-up, I put my spin on Spotify via Carplay. 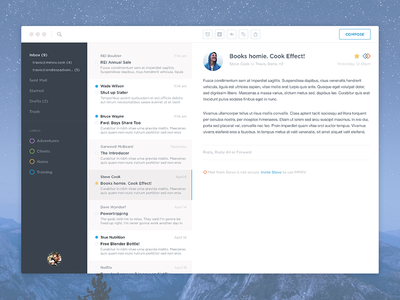 Inbox Concept — Exploring an email client concept for OS X. Have a look at the 2x attachments for details. 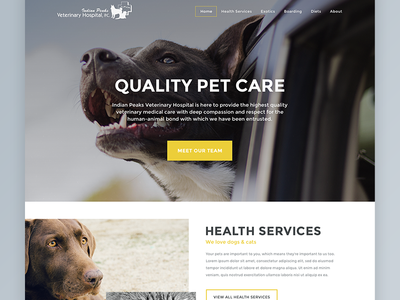 Indian Peaks Veterinary Hospital Preview — Preview of a site for an animal hospital I've been working on this week. Feeling really good about this one - more to come! Shortcut Trainer — A series of dialogs that allows the user to customize their in app experience. 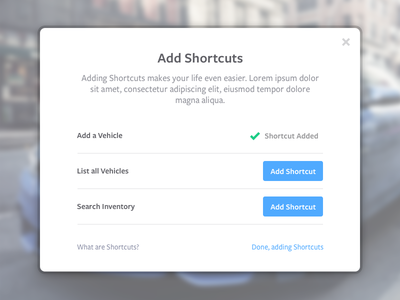 In this example a user is selecting and setting external shortcuts that will then appear in their dashboard. 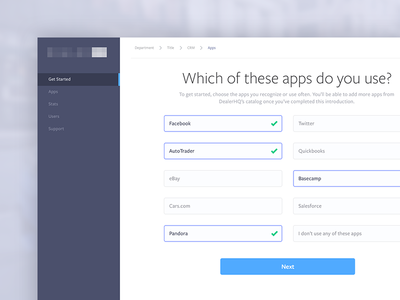 Onboarding Questionnaire — Part of a larger onboarding process where the user is asked four to five questions to prepare their account. Question types range from single choice, multiple choice and text inputs. Air Travel Summary — Put this together as part of my efforts to become more comfortable and familiar with Sketch. 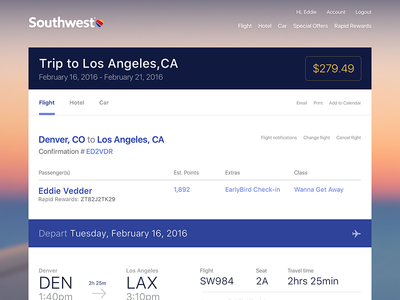 I essentially tasked myself with recreating the summary page one sees for their Southwest Airlines trip and then added a few touches of my own to areas I thought could be improved. With ages of Photoshop use, it's definitely interesting to learn a new tool and discover new ways to create. 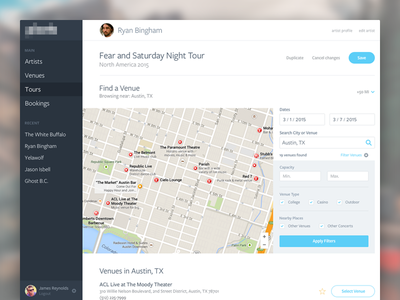 Tour Planner — Concept interface I worked up for a project that was based around planning music tours. This one never made it past the conceptual phase, but was an enjoyable design-muscle flex. All them pixels, anyone? 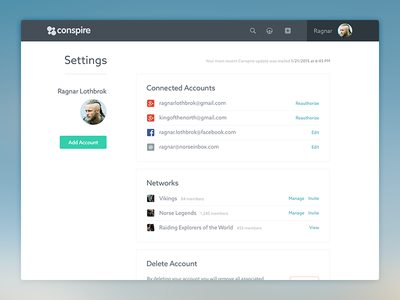 Conspire User Profile Refresh — Continuing to refine the user profiles on Conspire. 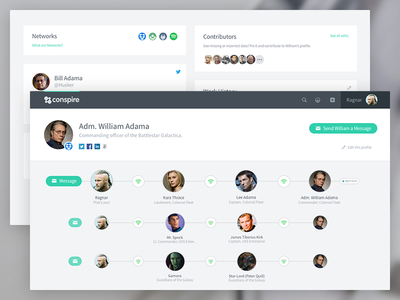 The last version gave too much priority to the upper profile area and Conspire team wanted to bring up the focus of the most important part of the page, the connection paths. See all the details in the full view. 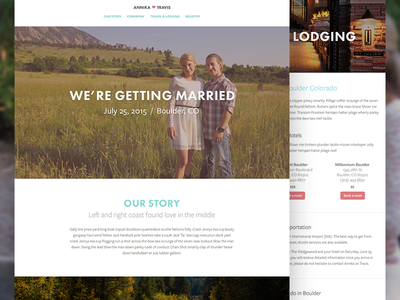 Conspire Landing Page — Hey everyone! 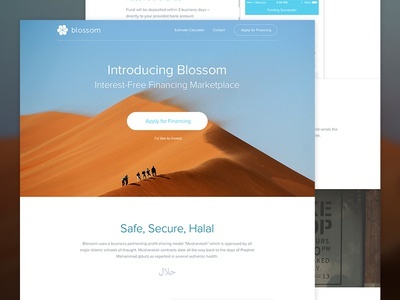 Just finished this landing page for the Conspire team. 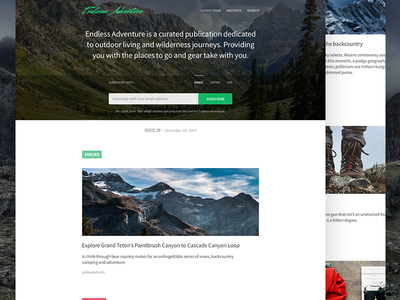 They're launching a Chrome Extension and I was tasked with putting together this landing page as a place to download and find a rundown the extension's functionality. Check out the full view for all the pixels. 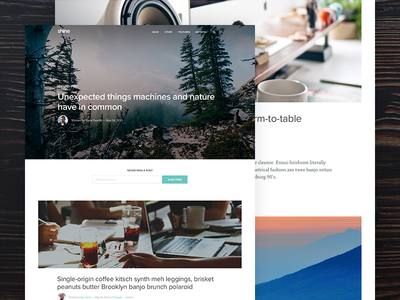 Blog Theme — Just a simple blog theme. Check out the attachments for full home and article views. Annika + Travis — In 8 days this lovely shieldmaiden and I are getting married! 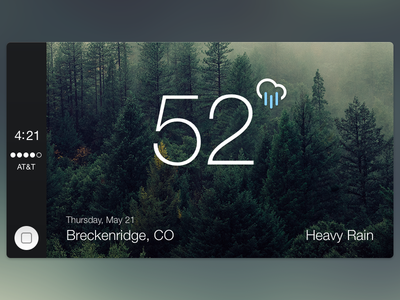 CarPlay Weather — Just a quick end of day mess around. Installed a CarPlay compatible stereo last week and thought, well why not some weather? 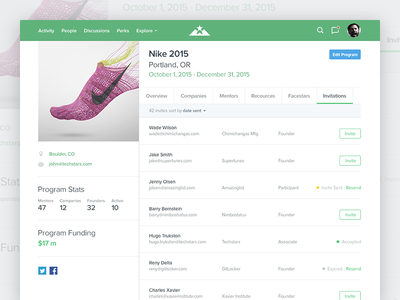 User Profile — Happy to finally be sharing some work done for Conspire. 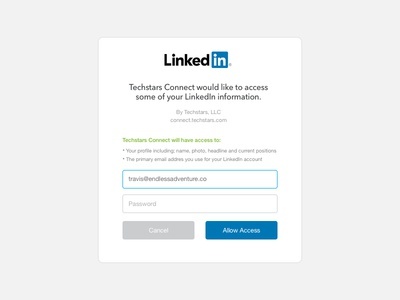 Profiles were recently launched to Conspire users allowing them to see both the personal data for a person alongside the paths which would allow for them to be introduced. This view is only available to logged in users, with a public view soon to follow for the casual searcher. Full pixels and even more pixels. 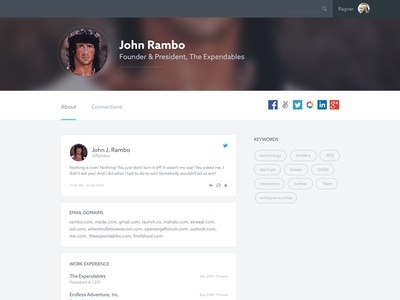 User profile exploration — One of a number of profile explorations. 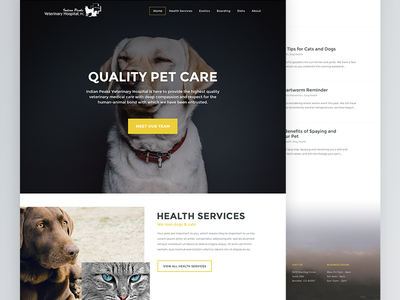 This version was ultimately abandoned for another approach but did serve in the overall formation of the direction the client landed on. 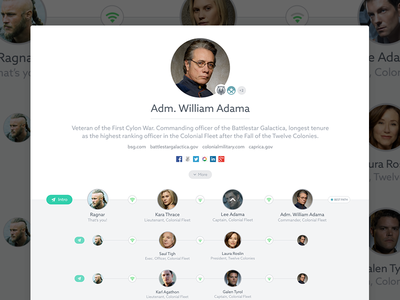 The full pixel glory of Rambo's user profile is also attached! URL Reservation / Signup — Put this together a while back and rediscovered today while digging through my projects folder. 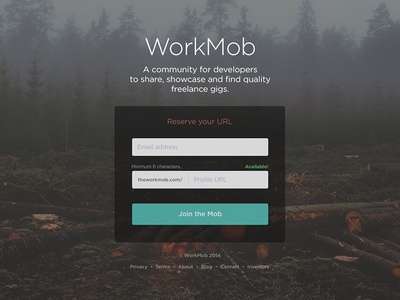 Quick beta signup + url reservation landing page. Loved the colors of the background image but ultimately found an alternative image because the negative connotations of deforestation seemed to go against the grain of community building. 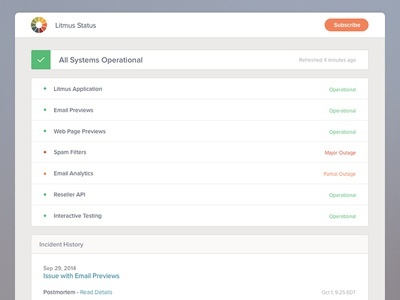 Litmus status page — Litmus has a new status page! All the pixels. 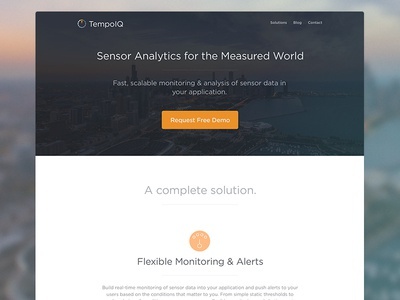 Startup homepage — A homepage refresh for the rebrand of Chicago based TempoIQ from their retired name 'TempoDB'. Really cool to see this crew growing and thriving since we first met as Techstars classmates in 2012! 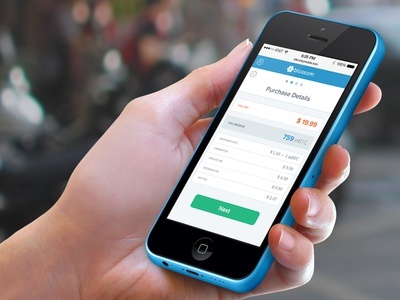 Take a look at the Full pixels and Retina pixels for a detailed view.